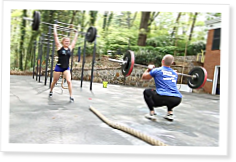 In Part 3 of this series, Tom Rowland, the CrossFitting host of the TV show Saltwater Experience, tackles Workout 11.3 with Brandon Phillips and Michelle Kinney in Chattanooga, Tenn. In the five-minute AMRAP featuring squat cleans and presses, thrusters or jerks, Phillips is working to get back to the Games to improve on 2010’s 11th-place finish, while Rowland is hoping to maintain the momentum he built with a great performance in WOD 11.2. Kinney, the 10-place finisher in 2010, is celebrating her 27th birthday and hoping for an equal number of rounds. Once the clock hits zero, Phillips has 66 points, Rowland has 40, and Kinney has 46 after notching 52 earlier in the week. The two former Games competitors are disappointed, but Rowland is happy with his score considering his max clean and jerk is 195 lb. and he was moving 165 during the WOD. Of course, everyone has a chance for redemption in the 12-minute AMRAP that represents Part 2 of the workout. Additional video: Update on the Open: Week 3. Great video. So motivating. Keep it up. This is a really nice film, Sevan. These people are real firebreathers but you show how they're just ordinary folks. I could almost picture myself working out with them. I only wish you had asked them about working out in Chattanooga outdoors in August when it's 96 degrees with 85% humidity.